Sturdy but lightweight hammock stand hand-made of hardwood. The cat hammock stand is constructed of four pieces that slide into each other. Assembled and taken apart in seconds for storage and travel. Attractive unfinished wood, smooth and obscures occasional scratches. Two-sided sling: Soft fleece for winter warmth; cotton for summer coolness. Sling is removable and machine washable. Replacement slings available. Hammock stand dimensions: 29" W x 17" D x17" H.
The hammock sling is the only thing you might ever want to replace. If you would like to purchase an extra sling, please go to Replacement Hammock Slings. Please indicate your choice of color/pattern in the Colors box above. Cats love to hang out in cat hammocks. 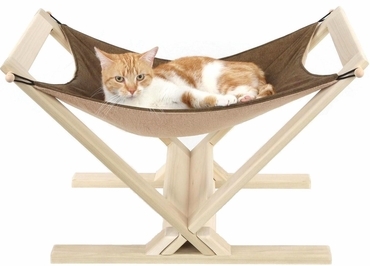 Your cat will love to hang out in one of our cat hammocks.